Ask most children where their food, clothes or toys come from and you'll likely hear some variation of "the store." 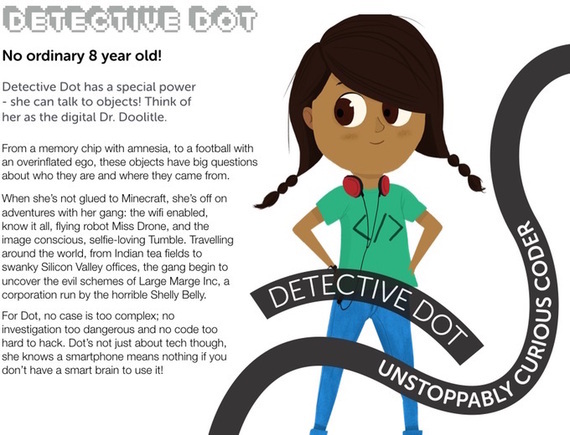 Enter "Detective Dot," an 8-year-old developer by day and detective by night who hopes to inspire kids to ask questions about the world around them. Dot is the heroine of a children's story app who has the ability to talk to her belongings and find out where they were made and their impact on the planet. She's the brainchild of Sophie Deen, former head of teacher training at a project backed by the Department of Education and Google called Code Club. "I was frustrated by how annoyingly stereotyped I found kids' toys to be, both through my work as a play therapist and as an 'auntie' to lots of kids. Zero percent of fictional princesses are coders or engineers, 2.9% of characters in children's books are black, and Batman doesn't recycle," says Deen. Waking in the middle of the night with those thoughts spinning in her head and the desire to teach children about fair trade, gender quality and the environment, Deen jotted down the idea for "Detective Dot." After receiving positive feedback on the concept from loved ones and kids, she decided to start Bright Little Labs. Taking advantage of the amount of media children already consume, Deen reasoned that a fun story app would be a natural way to connect with kids on platforms they're already using. Detective Dot is an 8-year-old developer by day and detective by night who hopes to teach kids about fair trade, gender quality and the environment. Her work at Code Club helped her realize the importance of teaching all kids about coding, and how it can help them become creators instead of just passive consumers. "Coding isn't just for boys, and contrary to stereotypes, is also really creative and can be used for anything -- from arts to investigative journalism," says Deen. "Dot uses computers all the time. She loves building stuff, and she loves getting Miss Drone, an Internet-enabled drone, new plug-ins and sensors to make her an even better spy sidekick." "Detective Dot" is turning out to be more than just a fun app. In June, a pilot program of 30 UK educators found it would also be a useful resource for teaching children computer science. And in October, curriculum materials for teachers were added to the "Detective Dot" vision. "There are some great tools around for young people (and their parents and teachers) to learn to code, but precious little that teaches them about code: not just its mechanics, but how it fits into the bigger picture and the impact it has on everyone's life," says Miles Berry, who teaches Computing Education at the University of Roehampton. "Bright Little Labs [is] well placed to address this. Dot's a great role model: not only can she code, but she cares that her coding makes the world a bit better." Along with input from various organizations, Bright Little Labs works with educators, illustrators, writers, and even comedians to produce its stories. Themes include sustainability, diversity, STEAM (Science, Technology, Engineering, Arts, and Math) education and fair trade. The initial story will be available as an e-book and a hardcopy. A Kickstarter campaign is also underway to raise funds and awareness of the project. "Detective Dot questions norms around her all the time and finds her own voice and her own way," says Deen. "Peer pressure can be hard to deal with. We're taught to believe we need to follow a particular path, and we're conditioned hard! So it's important to question everything." Joni Blecher is a freelance writer who has spent her career covering tech and a myriad of lifestyle topics. When she's not writing, you can find her exploring the food scene in Portland, OR.